Information, News, and Events in Outer Space! Our Sun isn't just the peaceful calming think you see and back in on a warm summer day. It has a life all of its own and sometimes that life can be pretty violent. The ocean can have its calm days as well as its hectic choppy wave days and the sun is very similar and works on a cycle of 11 years. Toward the end of this year we will be seeing increased solar activity. After it is over, we will activity drop off to its lowest point over 5 to 6 years called a solar minimum. During the solar max, the coronal holes on the sun will start to become large and spread from the poles as seen in the picture above. 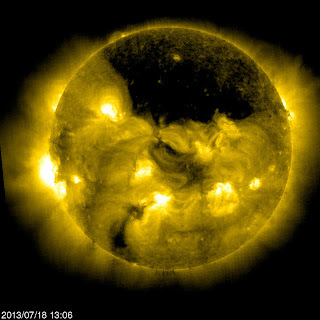 The coronal holes actually occur frequently on the sun and not much is understood about them. Usually we see the holes near the poles but during a solar max, we will begin to see them everywhere around the surface. We do know they contain much less solar material and are much lower temperature than the normal surface. Why be concerned with a solar max or min? One reason is the satellites that bring us both internet and television. The solar activity could send dangerous solar storms headed toward earth that have the potential to possibly damage our space equipment. The truth is, a solar storm has the opportunity to damage Earth and endanger human lives. The Sun is a very volatile place and holds a great deal of potential for both education and destruction however we rely on it absolutely. Just keep in mind that every 11 years or so, the sun could be out to get you and there is very little that can be done. We may be advancing to the point where we could have the technology to prevent loss of equipment or life and hide from solar danger. What outlandish solution do you propose to help protect humanity from the dangers of the Sun? Giant Umbrella Sun Shield?